Literal translation "Compete to contribute to the fund to assist the liberation"
Captured by the 3rd Platoon, B Troop, 2/17 Cavalry in action that occurred in I Corps before the move to Camp Evans. (We moved from LZ Pinky to Camp Evans on March 30th.) A former member of A Troop since May ‘67 and one of the guys who rotated into B Troop after Song Be was the one who actually captured the flag. They were ambushed, dismounted and formed an NDP. 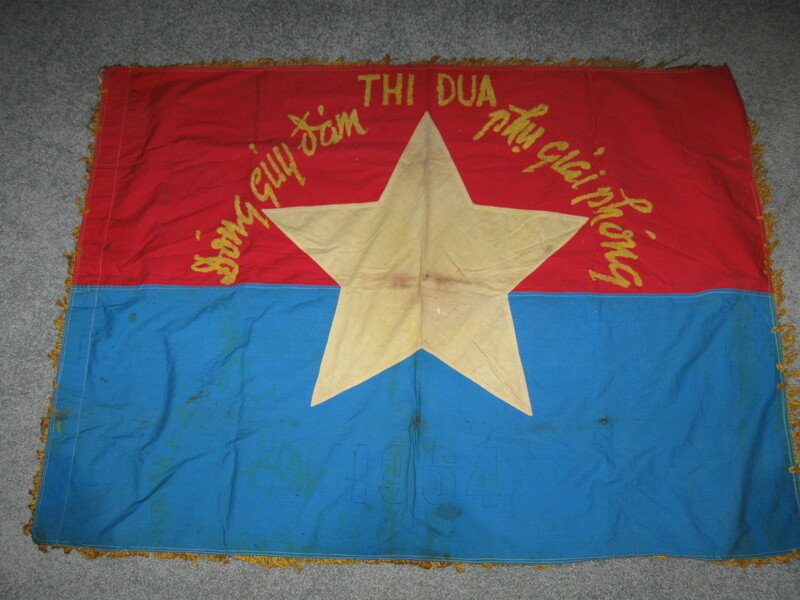 The next morning they swept the village where one of their platoon mates killed an NVA officer and captured the flag. He was leading a squad-sized patrol into the village when an NVA officer bolted out of the brush apparently trying to escape. He was running parallel to the patrol’s advance and He cut him down with a 3 round burst at close range. The NVA officer had the flag and a chicom pistol. He wanted the pistol and gave the flag to the Platoon Sergeant who gave it to an officer for safe keeping.